The biotechnology (biotech) industry is incredibly diverse. Recently, I wrote about the size of the biotech industry, which is, of course, related to how biotechnology is defined. As a strict definition, biotechnology is the use of biology to turn raw materials into useful products. However, the act of developing a biotech product requires many enabling technologies, reagents, and services that form today's modern industry. The term biotechnology was first coined in 1919 by Károly Ereky, a Hungarian agricultural engineer, who foresaw a time when biology could be used for turning raw material into useful products. The emerging field of synthetic biology represents the natural progression of this idea as our ability to synthesize gene sequences and engineer biochemical pathways and even entire microorganisms in rational designs for a myriad of purposes from speciality chemicals, to food, to energy improves. While biotechnology products such as bread, wine, and beer, have been around for millennia, the earliest biotechnology companies, as exemplified by Genentech, were founded in the late 1970s after the initial discoveries of restriction enzymes and the realization they could be harnessed for use in DNA cloning. Many of these companies focused on producing human therapeutic proteins, like human insulin, in cost-effective ways. To carry out this work, these companies also needed reagents such as restriction enzymes that were in themselves biotech products. Hence, an ecosystem of companies developed into a larger industry. That industry today is diverse and includes companies with therapeutic missions; technology focused companies that provide analytical instrumentation, systems for automation, reagents for assays and production; companies that focus on diagnostics for determining appropriate therapeutic and medical interventions; service organizations that specialize in using advanced technology as well as providing clinical trial, regulatory, and other experience to groups; and software companies that specialize in different kinds of informatics. Some companies are very large aggregates of many specialties and others, such as startups and early commercial ventures, are narrowly focused on a specific disease, application, or technology. For students gaining hands on training at one of the more than 100 Bio-Link.org programs throughout the United States, or in degree programs in colleges and universities, the biotech industry provides many opportunities. Basic training in preparing solutions, working with DNA and proteins, performing immunoassays, and working with lab equipment provide a common set of skills that fulfill many job requirements. As the Bio-Link programs also emphasize the importance of record keeping in laboratory notebooks, such students are well-suited for positions in industry. In addition to general lab skills, Bio-Link programs may also offer specialized training that is suited to local industry needs. The Biotech-Careers.org web site, with its database of over 5600 (and growing) biotechnology -companies and employers, provides an overview of the industry. Each biotechnology-company in the database has one or more assigned terms as a way to describe a business' core activity. These terms can be used to filter companies, based on what they do, to understand opportunities for educational objectives, trends for instruction, and job prospects for those seeking employment. The data can also be used to characterize the industry in general and local (by state) ways. Presently, nearly 400 terms are used to describe the industry. When the top 100 terms are visualized in a word cloud (above), where the size of a term indicates how many companies have that term, several themes can be be observed. A large number of companies (667) are engaged in small molecule development. 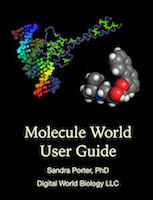 Who knew small molecules could be so big? A majority of these companies are traditional pharmaceutical companies, but as these companies can also have biotech products they are part of the biotechnology industry. The second largest category are medical device companies. These are in biotechnology because, like pharmaceutical companies, some device companies also make biotechnology products, and some devices are made from biological materials. Other terms in the word cloud emphasize the ecosystem nature of the biotechnology industry. Antibodies, for example, can be reagents in diagnostic assays. They can also be therapeutics. Contract services and research are activities that support other companies. Finally, these terms show the vast diversity of the industry. As noted Biotech-Careers.org describes the industry with nearly 400 terms. 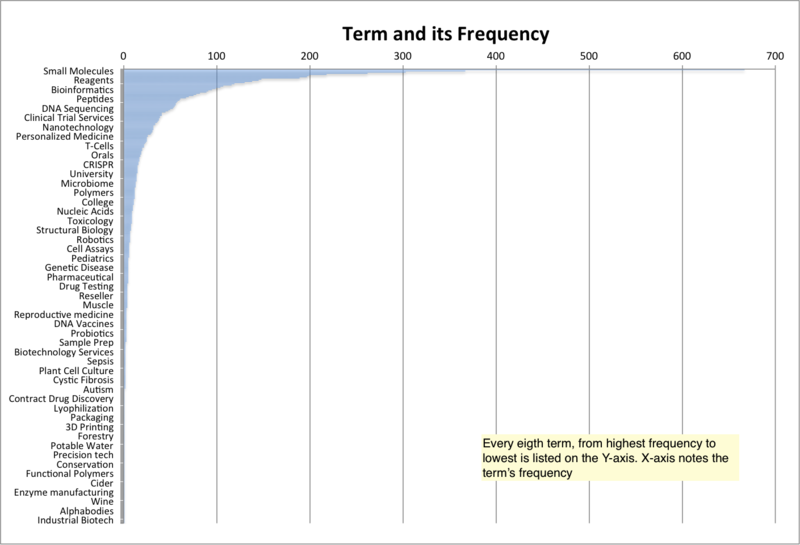 When the frequency of each term is examined, one sees that many terms are used only a few items; 279 terms are associated with 10 or fewer companies, and 115 terms are associated with only single companies. This long-tail appears because biotechnology is concerned with solving new problems by translating research discoveries into useful products to benefit society. As such the biotechnology field is always evolving–just like biology.